Beautiful, gorgeous turkey! Thank you for that tip on how to get the skin crispy. When you say add water shouls i add at this time the beer and broth also? If the amount of water is not enough to cover the turkey waht shoul i add? Thank!!!! I updated the post to make it more clear, hope that helps! If you have a huge turkey, over 25 lbs, then you should just double the brine recipe and that will give you enough. If it is just slightly too little, just add a bit more water or just rotate the turkey a little more frequently to make sure it all gets it’s share of the brine! I received rave reviews this year. Only had enough for 4 leftover meals. Will only use nut brown ale for brine from now on. Aw, this became an extremely good post. 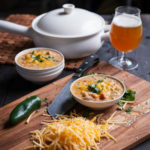 I love beer, but I had no idea I could cook so many things with it. I WILLbe trying this for next thanksgiving. Does the brining part of this work well frying a turkey? I bought a turkey fryer a year ago for home brewing and when I finally made a fried turkey I was hooked! Best turkey I have ever had. Thanks for any advice! And love your site! Brining works really well with a fried turkey, the main function of a brine is to infuse the meat with flavor and help it to remain really juicy. Let me know how it goes for you! Jackie- what kind of gravy would you suggest with this? I just make a simple pan gravy with the drippings, flour, broth and some butter. Maybe some sage. 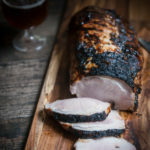 How would you adjust this for just a turkey breast? Much smaller brine, obviously. You can cut the brine time down to 6 hours and the drying time down to 8 hours (if there’s no skin, skip it). And the cooking time would be closer to 45 minutes. I made this last year and it was hands down the BEST turkey I’ve ever had. It is now the only recipe I’ll ever use. Is that copious amount of salt crucial to the brine? We are all on low-salt diets, and it is a kosher turkey. As a kosher turkey, it has been soaked and salted already. 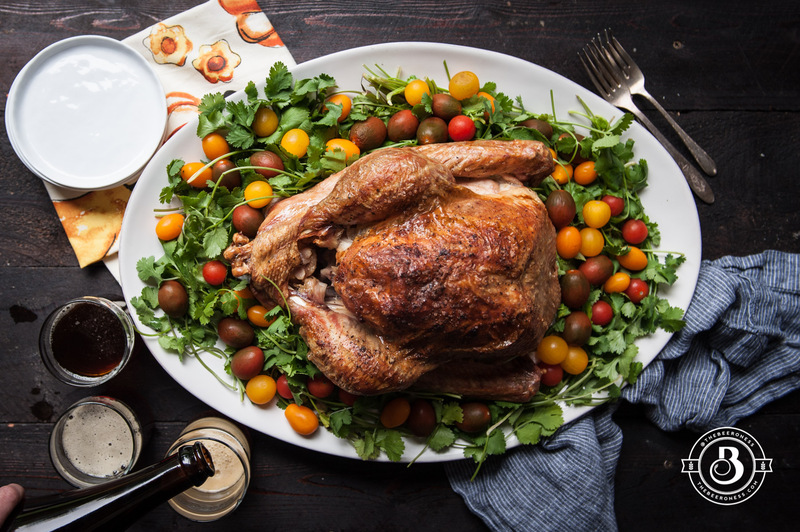 We had seen somewhere else that kosher turkeys do not require salt in the brine. Thank you. By the way, the marinated flank steak with the avocado cream sauce was stupendous. I just made this for Thanksgiving and everyone agree that it was the best turkey we have ever had. Thank you so much for the great recipe! Note to all: read the full instructions first. We were able to use only 1.5 cups of salt. We brined it in my favourite beer, Muskoka brewery dark ale. http://www.muskokabrewery.com/beers.php It is one of the semi-local breweries for us Torontonians. We did not leave the turkey on a rack to dry. That was the key part about reading the instructions in advance. I normally prefer the white meat on fowl. This time, the dark meat was remarkably succulent, with a bit of a smoky taste to it. We will certainly try this recipe again. It was delightful. Thank you. I am so excited to try this recipe!! 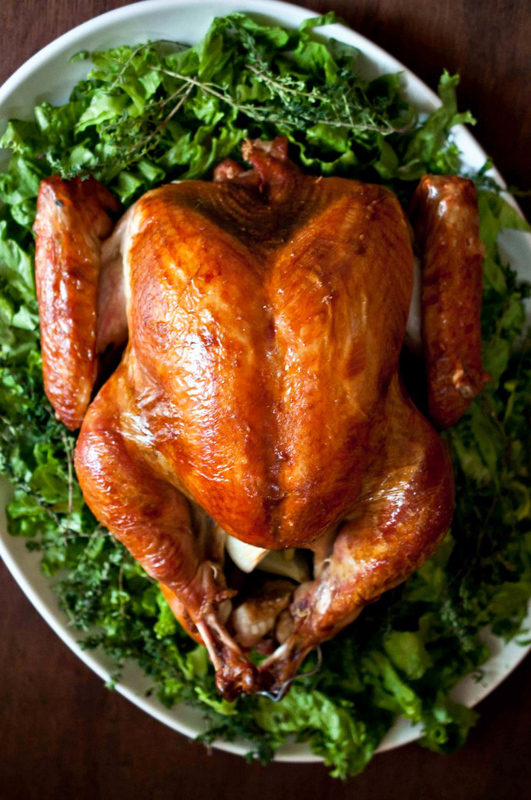 We make turkey 2 ways every year: roasted and smoked (and sometimes a third way: fried). The smoked version is made the day before Thanksgiving…my husband mans the smoker (after I have done ALL of the work in prepping the turkey and stocking the wood…then he takes the credit…LOL), invites his friends to join him outside as he keeps an eye on the temps whilst they drink copious amounts of various varieties of beer. I’d double the brine and use a clean 5 gallon bucket, if it can fit in your fridge! If not, try the oven bags, maybe use three. And have someone help you with getting the brine in the oven bags. I am doing a 24lb turkey and using a large cooler to put the turkey in with the brine, and using a brine bag inside the cooler. Put ice bags along with it to keep it cold and the cooler should do the rest. This sounds awesome and I can’t wait to make this. I was at Rogue Newport this summer. Rogue has a “garage” sale on major, or minor holidays. They sell tons of stuff for cheap. I procured a case of Hazel Nut Ale. My plan was to make snickers with it, combination of hazel nut beer and chocolate stout, yes it is as good as you think. Now I am also going to bring my turkey in it. Oh the heaven that it a good beer brine. Also Rogue has a Beer and Bed in Newport I suggest every one check it out if you like beer and sleeping above you pub? Who could say no. I forgot to add that the case of bombers was 20$. I’m giving this a go this Thanksgiving. One question: Does said roasting pan have a cover? I usually use a roasting bag, but I’m not sure if this should be without cover? Seems like that would dry out quick, but then I’m not sure where that would leave the crispy skin if I did use a bag or lid. I am wondering if you can give a conversion for the salt in weight.. I have different salt and it’d be a big help. 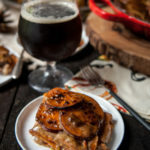 My hubby and I brined our Thanksgiving turkey with this recipe and then deep fried it. It was amazing! Super juicy and flavorful! My daughter used your recipe to brine her range turkey this year for our Thanksgiving feast….it was really the best turkey I’ve ever had! Now..wondering if you have ever tried this on chicken? I have 2 freshly processed chickens that I want to brine so was hoping to apply the recipe to them. I’m so glad! yes, I really think that all whole poultry absolutely needs to be brined. So I was sold at “beer brine” but my wife is worried about the beer flavor in the turkey in regards to making other things with the leftovers. 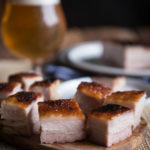 How strong of a beer flavor really gets into the meat? It’s really, really small. Most people can’t taste it. If you are worried just use 1/2 the beer and substitute the rest with broth, but I’ve never had anyone say they can taste it and I do serve this turkey to kids (although that’s your call). If you do stuff it, do so right before you put the turkey in the oven. 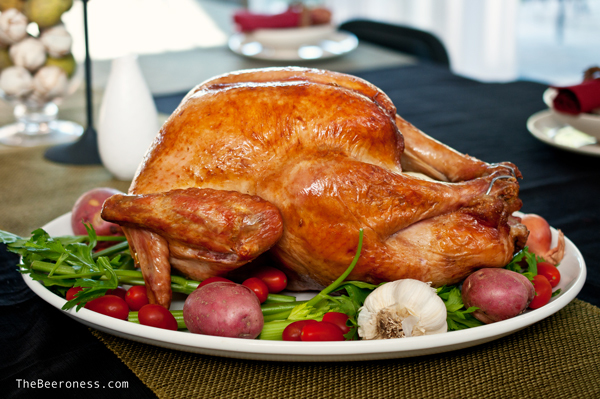 I’d also suggest taking the stuffing out and putting it in a dish and putting it back in the oven after you take it out of the bird to kill any bacteria that might still be hanging around, the center of the stuffing absorbs a lot of bacteria from the turkey when it’s raw but does not cook all the way through because it’s trapped in the center. Also, don’t add salt to your stuffing (if you use broth use low sodium broth as well) because the juices from the turkey will be injected into the stuffing and will be heavily salted. Hi, Thank you so much for this recipe. I have one question. Direction # 12. What broth are you speaking of? Is it the brine or the chicken broth? It’s the “2 cups of broth, plus water” that is listed in the ingredients just above “Additional equipment” If you want don’t want to, you can skip it. I’ve made that recipe without the broth in the pan and it turns out great as well. The turkey can get a little mealy and salty if you brine it longer than 18 hours and the job is done after 16. Too long of a brine and you run the risk of the meat breaking down too much. So excited to try this! My turkey is waiting to go into the oven. I am just unsure about the roasting temperature–400* seems very high and I have a convection oven. Should I lower the temp or will that mess up the results of this wonderfully brined and dried turkey?! Most turkeys are roasted at that temperature. If it won’t dry out because of the brine. I’ve made this turkey about a dozen times and it’s always great. I’ve never used a convection oven for this so I’m not sure if there is an adaptation that is used for roasting poultry but I think you should be fine. Just keep checking on it and tent it with foil if it starts to brown too quickly. I’ve always cooked at 400 for the duration, but feel free to play around with the temp. I like a really dark brown turkey.